Levon Aronian learned to play chess from his sister at the age of 9. His first coach was Grandmaster Melikset Khachiyan and he helped him to become a much stronger chess player in a short amount of time. Aronian’s first notable success came when he won the 1994 World Youth Chess Championship Under-12. He accomplished this win ahead of future world class players such as Ruslan Ponomariov and Alexander Grischuk. Aronian became an International Master in 1997 and a Grandmaster in 2000. 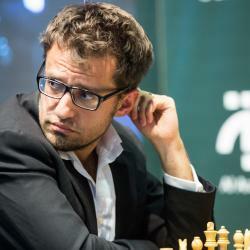 After becoming a Grandmaster, Aronian began to win a wide variety of tournaments. Just a few of these tournaments are mentioned: In 2002 he won the Armenian Chess Championship and also became World Junior Champion in the same year. In 2005 he reached a rating high enough to rank him as 5th best player in the world. In 2006 he won the Linares and Tal Memorial tournaments. In 2008 he tied for first place with Magnus Carlsen in the Corus tournament and won the Melody Amber tournament as well. In 2012 he played in the Tata Steel tournament and won it ahead of Magnus Carlsen, Hikaru Nakamura and Veselin Topalov. He holds a plus score against every notable Grandmaster except for Magnus Carlsen, Vassily Ivanchuk, Vladimir Kramnik and Veselin Topalov. The 10th highest rated chess player in the world at the moment (2765 - December 2018), Levon Aronian is shooting for the stars. This super-GM has countless accomplishments throughout his fairly short career so far, winning numerous tournaments. Described by other super-GMs as a “very gifted tactician” and “the most striking player around, with the highest creative level”, Aronian has impressed everyone with his rise. Although he has yet to play for the World Championship, he surely will become an incredibly strong challenger within the next few years.